Roy is mistaken for a bad guy expected by the local outlaw gang. He goes undercover to pin the goods on the bad guys. Just as he is about to do so, the real bad guy shows up. Roy and Gabby have to establish fair business practices in the town of Deadwood, currently dominated by entrepreneurs who scare off potential competitors. Shotgun Cassidy: You keep your pryin' nose out of my business. Brett Starr: That's what I'm doin'. I'm goin' to retire officially now. Shotgun Cassidy: Yeah? Well, I'm retirin' myself. Leastways I'm leavin' town. Brett Starr: Me, too. Dodge City's goin' to be kind of lonesome without us. Shotgun Cassidy: I'll be glad to take a partin' shot at you to liven things up! In Sheriff Of Tombstone Roy Rogers plays a Wyatt Earp like character who has quit being the marshal of Dodge City and is going west to Tombstone to be with his brothers and settle down in business. Problem is that Tombstone is a town in bad need of taming. 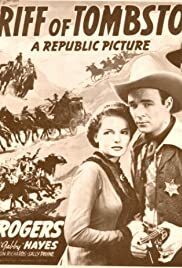 The outlaws as headed by Addison Richards see it that way also and they've sent for a notorious outlaw played by perennial western villain Harry Woods to see it's tamed their way. But Woods meets with a funny accident on the way, courtesy of Gabby Hayes no less who beats him to the draw. This may have been Gabby's finest hour as a western sidekick. Roy arrives ahead of Woods and Richards and his henchmen think Roy is Woods. Of course that doesn't last long, but Rogers is resourceful and you know the bad guys will be brought in line before the end of the final reel. Given the constraints of Republic Pictures budget for a B film, this one is not bad for its type. Elyse Knox who became wife of Tom Harmon and mother of Mark Harmon is the leading lady, she's the granddaughter of the head of a clan of mine owners who Richards and his friends are trying to squeeze out of business. Sally Payne is also around in a role as a spunky saloon girl who does a little espionage for Roy on the side. She gets almost as many musical numbers as Roy in this film. Definitely one for Roy and his devoted legion of fans.